Workers digging the site of the future World Trade Center underground parking center uncovered the remains of an 18th century ship. Maps as far back as 1797 show Washington Street on the site, and the area had not been developed in the construction of the original WTC, so the ship has been hidden under there for a couple hundred years at least. It’s not the first time a ship has been found on what is now dry land on the Manhattan waterfront, but it has been almost 30 years since the last one was uncovered on Water Street. It’s not the complete ship. It’s a 30-foot section of the keel of a vessel that was probably twice or maybe even 3 times that length whole. Archaeologists think it was deliberately deposited on the site as landfill to expand the island real estate. New Yorkers were known to throw everything and the kitchen sink into these foundation pits, so why not a third of a ship? Conservation is a major issue. 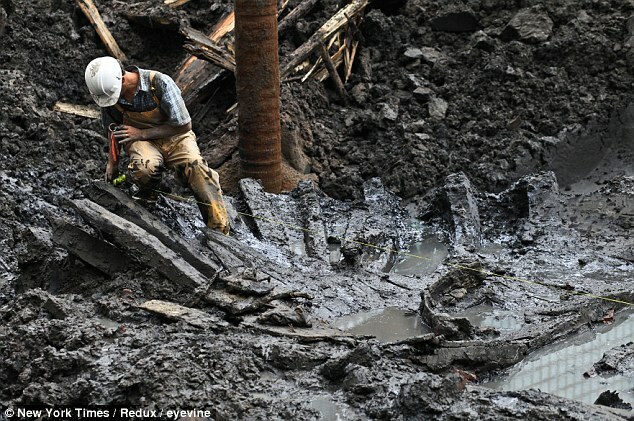 As soon as the timbers were excavated from their comfy muck and exposed to the air, they started to degrade. Meanwhile, construction continues all around, so archaeologists are scrambling to measure and record everything they can for later analysis. Excavators found several other interesting finds, both on the ship itself and in the area. There was a leather right shoe, an anchor and some spikes that might help narrow down the ship’s age. Dendrochronological analysis (counting tree rings) should also be able to pinpoint the date. Perhaps the most puzzling and intriguing find was a semicircular metal collar, several feet across, apparently supported on a brick base, built into the hull. Perhaps it was some sort of an oven or steam contraption. Some of the whaling enthusiasts commenting on the article suggested that it was a fire-powered fixture that helped sailors process blubber. Archaeologists point out that it’s more likely have been a garden variety cooking platform. The blubber processing apparatus would have been larger.